I interviewed independent film-maker Molly Brown, winner of the Golden Trellick Award at the Portobello Film Festival. Molly is a prolific director who scripts, shoots and edits films involving actors and animations, covering a wide range of genres including comedy, horror and parody – though if asked, she will say that if she has a genre, her genre is ‘silly’ – and does it nearly all by herself! Her work has been included in more than 300 screenings, including official selections in film festivals in the U.K., Germany, Austria, Canada, the U.S., Australia, Serbia, Italy, and France. Leslie: Can you give an overview, please, of the large number of zero-budget shorts you’ve made. Molly: I think I’ve made more than eighty shorts now and when I say ‘zero budget’ I really mean it; there is no way I could make more than eighty films – even very short ones – if I was spending money on them. The live action scenes are shot in front of a green screen in my tiny living room and the animation and editing is done in the spare bedroom I use as my office. The way I manage to do everything for free is to do pretty much everything myself. My main exceptions to the ‘do everything myself’ rule are the occasional male voice-over; I have a pitch filter with which I can lower my voice enough to make myself sound like a teenage boy, but if I lower the pitch too much the audio becomes distorted. So when I need a realistic-sounding adult male voice I have to ask a guy. And very occasionally I might ask a musician friend to create some original music for me. Leslie: What’s the story behind winning the Golden Trellick Award for Best Comedy at the Portobello Film Festival? Molly: They’ve screened something of mine in every edition of the Portobello Film Festival for the last six years – and I had previously been on the shortlist for an award four times without ever winning anything – so winning Best Comedy in 2018 for ‘My Crazy Hand’ was a (pleasant!) shock. 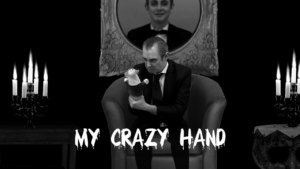 Leslie: How did the script and shooting of ‘My Crazy Hand’ begin, grow and develop? Molly: There is a horror film festival called Horror-on-Sea which is held every January in Southend, and they’ve screened something of mine – usually a compilation of several of my shorts – in every edition for the last five years or so. The first time I went, I’d never been to a horror film festival before and had no idea what to expect. 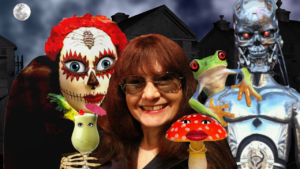 I was worried that people who were into scary films would be scary themselves, but nothing could have been further from the truth; everyone I met there was friendly and jolly and absolutely lovely. (And I must give a shout-out to the Festival Director, Paul Cotgrove, and his team; I’ve never been to a film festival with such a warm and supportive atmosphere.) Since then I’ve made a point of going every January and I love it; it’s not only fun but I’ve made many friends there who I’m in touch with throughout the year… not just in January. A few years ago I met an actor named Cy Henty and his fiancée, Michaela Hunt, at Horror-on-Sea and in 2017 we decided it would be fun to make a film during the festival. I dashed off a (very silly!) 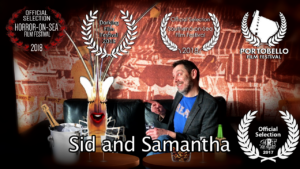 script called ‘Sid and Samantha’ about a man who becomes romantically involved with a prawn, with Cy playing the man and Michaela as the voice of the prawn. 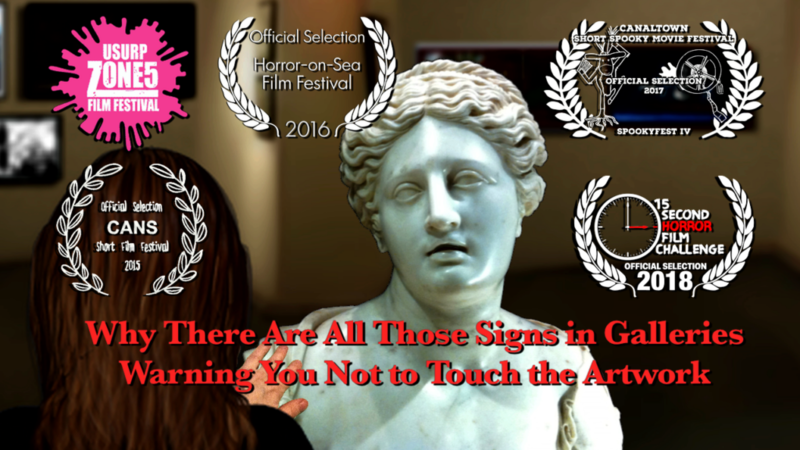 ‘Sid and Samantha’ went on to be one of my films screened in the 2018 edition of the Horror-on-Sea festival, as well as the 2018 edition of the Portobello Film Festival, the 2017 Art All Night Film Festival in Trenton, New Jersey, plus a few other festivals. The live action scenes with Cy and Michaela were shot in front of the green screen in my living room, while Pablo and Ben recorded the voices for a number of animated characters remotely and then sent me the audio files. People are always asking where I shot this or that scene, so I should probably point out that none of the locations in ‘My Crazy Hand’ – or any of my films, for that matter – are real places. I always build the locations myself by combining elements from numerous different images of different types. For example, I may combine a photograph I took of a floor – I’m always photographing floors – with other photographs of walls (I photograph walls a lot, too), windows (ditto! ), ceilings, etc., to create a basic room set. Then I’ll layer it up with furniture and objects that I have either photographed or made in a 3D modelling program. Or sometimes I will draw something (though my hand-drawn backgrounds tend to be more abstract because I’m better at that). So in all the scenes where Cy Henty is playing the piano in ‘My Crazy Hand’, he was actually just sitting on a little stool covered in green cloth, miming a bit of ‘air piano’. Leslie: You’ve produced a film for an art gallery and had work shown in art galleries and museums. How did this differ from your genre short films and animations? Molly: The one I produced with a gallery in mind was ‘Date At Tate’, which I made for the Tate Britain/Kino London 48 Hour Challenge in 2013. The idea was that filmmakers had forty-eight hours to make a film celebrating the chronological re-hang of Tate Britain’s British Art Collection. All the finished films – Including ‘ Date At Tate’ – were screened in the auditorium at Tate Britain during the official launch of the re-hang the following weekend. The other screenings in museums and galleries have been of pre-existing work. I am always surprised and delighted whenever something I made is presented as ‘video art’. Apart from one or two animations that are a bit more abstract than my usual productions, the works that have been screened in galleries are the same works that have appeared in film festivals under the heading of ‘comedy’ …or whatever. As to why some of my videos might be presented as ‘art’ while others are not, I have no idea. I guess art – like beauty – is in the eye of the beholder. Leslie: What are the key differences between working in animation and with actors? Molly: If you want an actor to stand up and walk across the room, you just tell him or her what you want them to do and they will do it. If you want an animated character to stand up and walk across the room, you have to figure out how to manipulate that character into a standing position and then get them from one place to another, one tiny movement – and one single frame – at a time. I could go on and on citing examples of things that are simple for a live actor to do but extremely difficult and complicated to animate, but I’m sure you get the idea. Leslie: Who are your most important influences in film and why them? Molly: He wasn’t really a filmmaker, but over the years I have become more and more enamoured with the work of Ernie Kovacs. He was a pioneer of early television who delighted in surreal, experimental visuals and has been described as: ‘television’s first significant video artist’. I wouldn’t dream of comparing myself to him, but I can see some definite similarities between his view of the world and mine. Another person whose work I admire so much I wish I had *been* him, is Jay Ward who was the creative genius behind, in my opinion, some of the most hilarious cartoons ever. And then there’s the Goon Show and Round the Horne, which – I hear you shout in protest – are radio, not film. What I’m getting at is that I have a fondness for the surreal and subversive humour of the late 1950s through the mid-1960s. I was obviously born too late; I should have been a beatnik. Next week Watford rapper, columnist and dream interpreter, Stacy Hart, talks about music and dealing with personal loss/M.E. while continuing to help other people. Previous PostWORDS AND ART FOR A CHANGING CLIMATENext PostLOVING LIFE, ACTS OF MERCY AND RAPPING WITH M.E. What goes into a vision is always more than most people think. Thank you for sharing another visionary’s story.